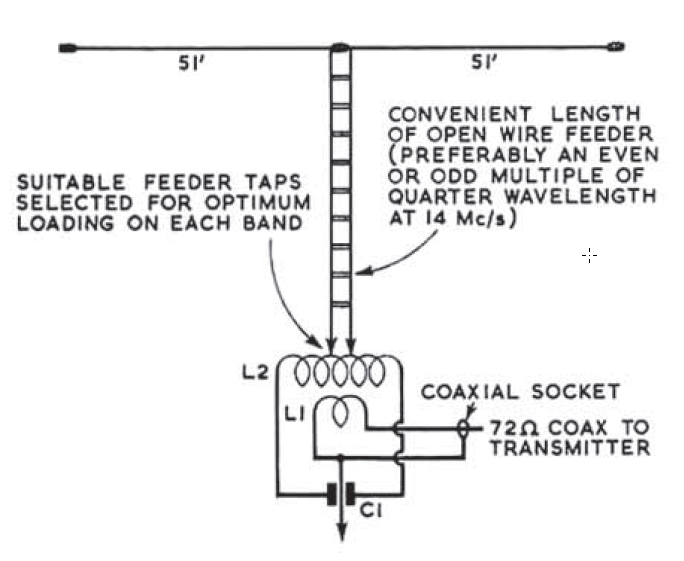 A G5RV is an antenna system described by Louis Varney, G5RV, in several articles from 1958 to 1984. A G5RV has been in use at VK1OD for six months. The configuration in use is the so called tuned feeders configuration, ie the dipole is fed entirely with open wire feed line from the ATU/ balun to the dipole centre. The implementation is described in detail, and performance verification detailed at Bowral G5RV for local contacts. Use of the G5RV attracts frequent reaction from self appointed experts on what is and what is not a G5RV. There is an insistence by many that a G5RV has a hybrid open wire / coax feed system; that anything else is not a G5RV. Alternatively, open wire feeder may be employed from the centre of the aerial right back to the transmitter output or ATU. That article also included the following schematic. Clearly, not only was solely open wire feeder (tuned feeders) an option in his mind, it is one of the configurations he tested and detailed in a schematic in his first significant article on the system. works very poorly on some WARC bands and 10m. It is the poor performance of the hybrid feed on some bands that gave rise to Brian Austen's ZS6BKW variant which is better than the G5RV on some bands, poorer on others, but not as good overall as a G5RV with tuned feeders. We have bred hams who have formed strong opinions on things without sound research. They stand ready to sprout ham folk lore as fact, and to pass technical judgment on systems that they don't understand, and lack an open mind to learn. The latter is not surprising, as Jonathon Swift noted [i]t is useless to attempt to reason a man out of a thing he was never reasoned into . Varney, Louis. July 1958. An effective multi-band aerial of simple construction In RSGB Bulletin July 1958.